Fan Forum > Requests > WWE Campaign Thread: Because Vince McMahon Would Want Us To Have Our Board Back! WWE Campaign Thread: Because Vince McMahon Would Want Us To Have Our Board Back! We deserve to get our board back! According to several reports, the elder McMahon warned his son: "Vinny, what are you doing? You'll wind up at the bottom of a river." In spite of such warnings, the younger McMahon had an even bolder ambition: the WWF would tour nationally. Such a venture, however, required huge capital investment; one that placed the WWF on the verge of financial collapse. The future of not just McMahon's experiment, but also the WWF, the NWA, and the whole industry came down to the success or failure of McMahon's groundbreaking concept, WrestleMania. The original WrestleMania, held in 1985, was a resounding success. This event is sometimes credited as the debut of what McMahon called "sports entertainment", in contrast to his father's preference of pure wrestling. The WWF did incredible business on the shoulders of McMahon and his all-American babyface hero, Hulk Hogan, for the next several years, creating what some observers dubbed a second golden age for professional wrestling. In 1993, the WWF broke new ground in televised professional wrestling with the debut of its cable program WWF Monday Night Raw. After becoming a runaway success, WCW in 1995 countered with its own Monday night cable program, WCW Monday Nitro, in the same time slot as Raw. The feuds and match types developed by the end of the mid 1990's began a new era in wrestling. The fans of the WWF seemed to favor what was posed to them as the bad guy instead of the good guy. The creative changes made by the WWF creative board saw wrestling take on a "street fighting," "bad attitude" approach, however despite the revolutionary changes in sports-entertainment that the WWF founded, these years remain the lowest of the WWF's financial income and a heavy loss in fandom to rival WCW. By January 1998, the WWF began broadcasting more violence, swearing, and more edgy angles in its attempt to compete with WCW. After Bret Hart left for WCW following the Montreal Screwjob incident, Vince McMahon used the resulting backlash in the creation of his "Mr. McMahon" character, a dictatorial and fierce ruler who favored heels who were "good for business" over "misfit" faces like Austin. 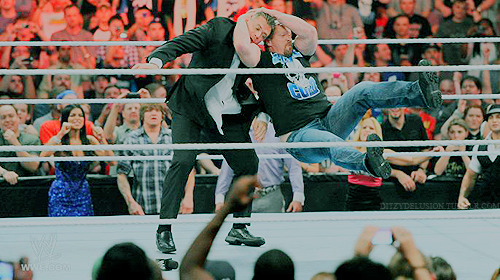 This, in turn, led to the Austin vs. McMahon feud, which, along with D-Generation X, officially began the Attitude Era. The Attitude Era turned the tide of the Monday Night Wars into WWF's favor for good. After Time Warner merged with AOL, Ted Turner's power over WCW was considerably reduced, and the newly merged company decided to get rid of WCW entirely. In March 2001, WWF Entertainment, Inc. acquired World Championship Wrestling, Inc. from AOL Time Warner for a number reported to be around $7 million. With this purchase, WWF was now the largest wrestling promotion in the world, and the only one in North America with mainstream exposure. On May 5, 2002, the company quietly changed all references on its website from "WWF" to "WWE", while switching the URL from WWF.com to WWE.com. The next day, a press release announced the official name change from World Wrestling Federation Entertainment, Inc. to World Wrestling Entertainment, Inc., or WWE, and the change was publicized later that day during a telecast of Monday Night Raw. In March 2002, roughly two months before the name change, WWE decided to create two separate rosters, Raw and SmackDown! due to the overabundance of talent left over from the Invasion storyline. This is known as the WWE Brand Extension. In addition to the Brand Extension, WWE holds a Draft Lottery every year. On May 26, 2006, WWE revived Extreme Championship Wrestling as its third brand. I miss the old board, so definitely add me! Hopefully we can get it back, at some point. You can add me... I've missed visiting that board, especially since I'm able to watch wrestling a bit more regularly now. is this gonna be WWE or wrestling in general? I think WCW could be branded into it too seeing as Vince took over. On the old board, IIRC, it was headed WWE, but it was anything wrestling, really. TNA had its own thread, etc.. Cool I'm sure we can make it overall a "wrestling" board. Add me too. Unfortunately I was around when the Wrestling board was too but never really paid attention to it. I will now. I'm in. But if this is going to be on the Special Requests poll, I'll just be here to support it (there's another campaign I'm running for that one). Yeah, I miss that board too. It was one of the very few boards that I first posted on.